This is an intriguing and most rewarding disc. Combining Croydon Minster Choir and the English Cornett and Sackbut Ensemble is ‘an experiment’ as the sleeve note reminds us – and it is successful. Lewis Jones is to be commended on his arrangements, and Ronny Krippner on his direction. No doubt Archbishop John Whitgift, after whom the participating school is named and in celebration of whom the disc was created, would have approved. He himself had sanctioned the combined use of voices, organ, cornetts and sackbuts at Canterbury Cathedral (as reported by an Italian visitor in 1589). Indeed, as part of his strongly anti-Puritan stance, he was altogether a great supporter of church music, which had been systematically threatened in the middle years of the 16th century. None of the 12 works on this CD is known to have been connected directly with Whitgift. 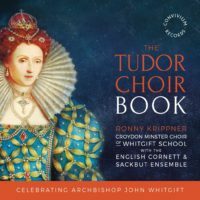 But together they form a fascinating and diverse collection of vocal and instrumental music mostly from the late Tudor period (although not belonging to any particular ‘Tudor Choir Book’). A few pieces must postdate the ‘official’ end of the Tudor period, Queen Elizabeth’s death in 1603, notably the Short Communion Service and the anthem ‘O Sing Joyfully’ by Adrian Batten who was born in 1591. It was good to steer clear of Byrd, Gibbons and the ‘usual’ Tallis anthems and motets (all so frequently recorded), while providing some concessions to the familiar. The final vocal item is the celebrated tune for Psalm 100 by Louis Bourgeois – ‘All people that on earth do dwell’ – and the first is Tallis’s setting of Psalm 2, with the Phrygian-mode tune on which Vaughan Williams built his 1910 Fantasia. Musically the work of Thomas Morley stands out – it is good to hear his fine First Evening Service and also his moving setting of ‘Out of the deep’. ‘Bow down thine ear’ is a version with English text of a madrigal by the distinguished expatriate composer Peter Philips (who was featured on the Convivium disc ‘Peter Philips: an Englishman Abroad’, CR007). Nathaniel Giles’s setting of ‘God, which as on this day’, the Collect for Whitsunday, is perhaps over-extended, but the chromatic writing near the end is worth waiting for. The collection gives pride of place to ECSE by beginning and ending with performances of Fantasias by Giovanni Coperario and Jerome Bassano (the former originally John Cooper before prolonged exposure to Italian culture, the latter a member of a prolific Italian musical family active in England). As a kind of interlude we hear ‘Exaudi Deus’ by another Italian, Alfonso Ferrabosco the Elder. The standard of vocal performance is satisfying throughout, with some good solo work in, for example, Morley’s ‘verse’ service. Occasionally perhaps one tires a little of the sound of the accompanying sackbuts. But this is a very minor quibble. This CD is a valuable addition to the increasingly diverse and enterprising catalogue offered by Convivium Records International, and I heartily recommend it. Dr. Hugh Benham is a writer, composer, Chairman of the Academic Board (Guild of Church Musicians) and of Winchester Area’s Royal School of Church Music committee.